Driving is a life skill that most people try and possess at one point or another. Before you’re let loose on the roads, you have to pass both a theory and practical test – and after seeing how one woman failed her practical, you probably wouldn’t be blamed for hoping she never gets a second chance. The woman was apparently doing quite well, until she crashed into the front window of her driving school. Yeah. Her driving school’s Front. Window. 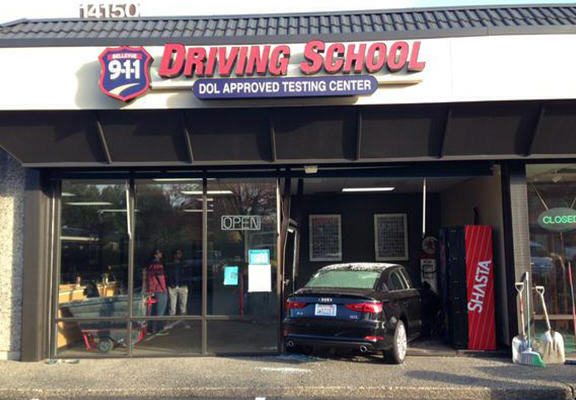 Unfortunately, that student mistook the gas pedal for the brake, sending the car into the building. She was doing great up until that very last part… (and she) did drive through a plate glass window, so that was a fail on the test. Thankfully, police added that the woman and her driving instructor were unharmed. The shop window however was f*cked.